There are various places around the edge of the Kathmandu Valley offering great mountain views. One of such areas is Nagarkot. 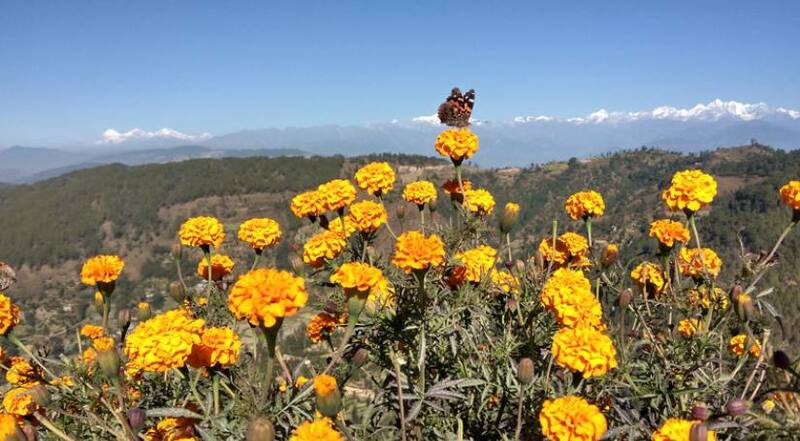 Whereby, it does not only provide magnificent views of Himalayas but also the resort village of Nagarkot. It is generally held to be the best mountain watchers make their way up to the village, stay overnight in one of Nagarkot's lodges or hotels than rising at dawn to see the sun appear over the Himalayas. Nagarkot is a popular tourist resort of Nepal. It is situated some 32 Kilometers east of Kathmandu at an altitude of 2175m above the sea level. The panorama of the major peaks of eastern Nepal Himalayas including Mt. Everest can be seen from here. Himalayan peaks like Manaslu (8463m) Ganesh Himal (7111m) Langtang (7246m) Gaurishanker (7134m) can also clearly seen from Nagarkot. A motorable road links Nagarkot with Bhaktapur. Kakani is located 29 km north-west of Kathmandu at an altitude of 1,982 m above the sea level. It is famous for the magnificent views over Kathmandu Valley and the north-western Himalayas ranges against the vastness of the sky. The fabulous area of Kakani features attractions ranging from beautiful alpine scenery to the magnificent Himalayan Panorama particularly the Ganesh Himal massif. A close view of the other peak of the Himalayas which can be seen from here is Gaurishanker (7134 in), Choba Bhamte (6016 in), Dorje Lakpa, Manaslu (8163 in), Himalchuli (7893 in), Annapurna (8091 m) and the other several peaks. A majestic view of the sunset can also be seen from this place. A trip to Kakani along the beautiful highway of Trishuli road is scenically rewarding with green forest and mountains grandeur in one direction and fertile river flats and terraces cultivation on the other. This road begins from Balaju and terminates at Kaule from where the road bifurcates. Dhulikhel is an ancient town located at 30 km east of Kathmandu along the Kathmandu - Kodari or Arniko Highway (way to Tibet). It is famous for its scenic beauty and tradition-- a lovely place. From this place, one can have a complete panoramic view of the snowy ranges of the Annapurna range, Langtang, Choba Bhamre, Gaurishanker, Number Karyolung among others. From Dhulikhel, you also can have a good view of the sunrise. Namobuddha is situated on the hill above Panauti. It is especially famed for hiking and meditation. Whereby situated of Buddhist monastery called ‘Namobuddha’. There is an amazing story concerning Buddha being commemorated by an ancient stone slab and a stupa with the all-seeing eyes of Lord Buddha. It is an ideal place for in meditation. It is located about two and a half hours north of Dhulikhel on foot, near the tops of jungle ridge. During February-March Tibetans and Bhotias arrive here for praying. A trail leads up to a bigger Tibetan gompa on the top the hill of the Namo Buddha. According to the fable Buddha, in one of his previous lives as a hunter, encountered a starving tigress and her cubs here, and moved by compassion, offered his own flesh to her, a sacrifice that helped pave the way for his eventual rebirth as the historical Buddha. The stupa is supposed to contain the hunter's bones and hair. If you want to do a day hiking with us, you can Call, WhatsApp, Viber at +977-9851031957 (Cholendra) or call us at landline phone +977-1-4002044, +977-1-4389620 or email us at info@himalayanjoy.com.